A person like Mr. Tran Van Khe is well respected by everyone. He was a gifted person of the country. But his talent is not so important as his commitment and ways of thinking about his responsibility to Vietnamese people. He was very lucky because he and his family lived in the province which was the origin of cai luong. If he could have completed and presented the document about cai luong to UNESCO, that would be perfect! But it is life. It means there are unfinished works. Nevertheless, his life and passing were very beautiful. English has two words “worry” and “take care”. There are people who always worry about work. “Take care” means to take time and do things with care. He belongs with the later type. This is what I learned from him. When one is loved and gains respect from the public, one should work and live like him. Scientist Einstein invented the relative theory, Buddhism has a neutrality. I think we should appreciate what we have since one day it will be gone. If one often thinks like this, one would not harm others. The most admired manner about Mr. Khe is that he lived, worked and tried very hard not to hurt anyone. If we are too aggressive, we might overact and accidentally hurt others without knowing it. Professor Khe did not have this tendency. Most of all, he kept his private life to himself and resolved it without bothering other people. I admire and respect the way he lived. Everyone has their own prejudice, their own suffer. We all come and go. It is the universal rule. It is lucky for those who come with welcome and go in sorrow from others. He was that kind of person. “I respect the Professor’s talent, personality and dedication, especially his affection and preservation of cai luong. The history of cai luong was preserved and passed on to the next generations by the life and appearance that was full of culture and characteristics”, People’s Artist Bach Tuyet talked about Professor Tran Van Khe with the TPHCM newspaper. Dear People’s Artist Bach Tuyet, Professor Tran Van Khe was the greatest musicologist of the traditional music and theater. We are always grateful for him because of his life and works. What are you most impressed about his career? Professor Tran Van Khe devoted his life and works to introduce Vietnamese traditional music to friends in the five continents. He promoted Vietnamese culture to the world with all his heart, responsibility, talent, and knowledge; and most of all with his pride in our traditional music. Not only artists, but many Vietnamese around the world admire him and appreciate his devotion. As a well-known actress in Vietnamese theatre, what do you and other artists learn from Professor Tran Van Khe? Retaining, researching, exploring, creating and spreading the love of traditional music to others with one’s own way. In this non-stop journey, you will receive unlimited energy of creativity. We do it because we were born from it. We do it as a returning of appreciation, bridging and nurturing Vietnamese roots within ourselves and everyone. Do you have any memory about Professor Tran Van Khe? He always came and watched many of my shows. He sat, enjoyed, and followed them delightfully. From the stage, I silently thanked him for those moments. He was the artist, and I was his audience for his passion and intellect in music within a Vietnamese spirit. From a viewpoint of a Doctor of Arts and of a People’s Artist of cai luong, what do you think about the contribution of Professor Tran Van Khe to cai luong? 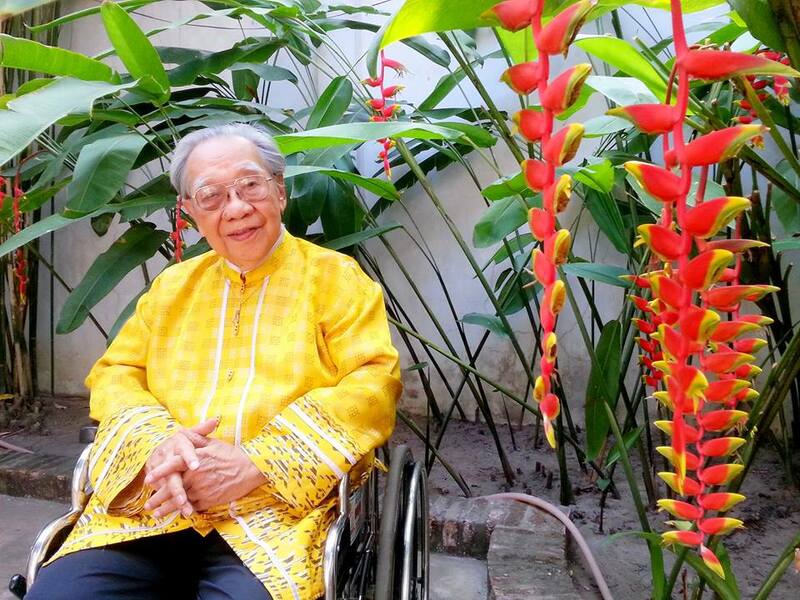 Professor Tran Van Khe was a friend of my teacher – People’s Artist Phung Ha. I respect his talent, personality and dedication, especially his affection and preservation of cai luong. The history of cai luong was preserved and passed on to the next generations by the life and appearance that was full of culture and characteristics. Beside your contribution for the stage, you have spent time in research and writing. Have you ever thought that you would have a big project writing about Professor Tran Van Khe or about your life? I am an actress. I read and listened to his speeches about cultures. It is the fundamental background for an artist. I am very grateful for this. With regards to the project, I can’t promise it although my thoughts about him always exist, and my respect to him is unchanged. At this point, talking about the late Professor’s dedication, what are you thinking about your life? What will you do for the arts and for the country? I am just a small student in thousands of students of my teacher and many legendary masters of the traditional music. I learn how to live and work like them with my creativity. What I give to the world are my characters, not my real self. Therefore, I will learn from him – passing the fire, continuing working, passing the creativity and my humble knowledge to the next generations if they need me.